now two great books in one! 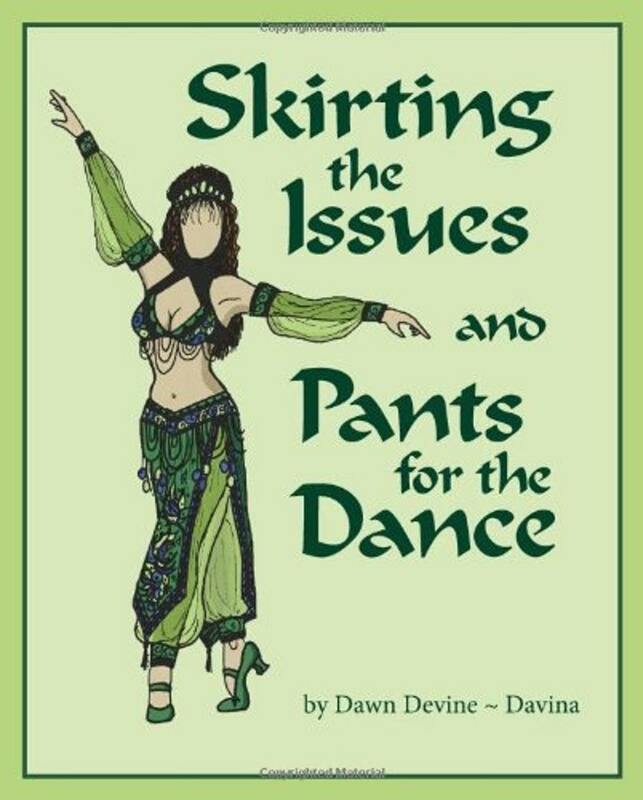 Dawn Devine ~ Davina has combined volumes 2 and 3 of her Belly Dance Costume Essentials series into a single edition, Skirting the Issues & Pants for the Dance. 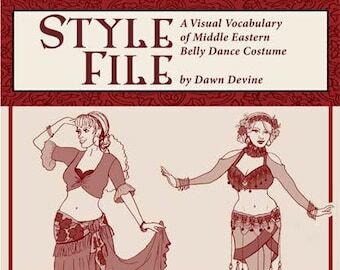 Designed for dancers, designers and costume makers, this book offers hundreds of ideas, tips and hints for crafting original, beautiful and well-constructed belly dance attire. 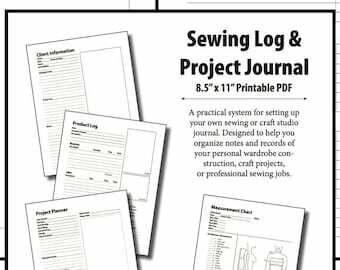 This book is lavishly illustrated with instructions for how to take your body measurements and draft your own custom fit patterns. Skirting the Issues focuses on the wide variety of popular and easy to sew skirt styles for belly dancing costumes. 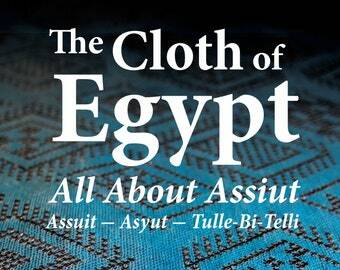 The first half of this book presents dozens of skirt designs; including straight skirts, full skirts, circular skirts, tiered skirts, skirt toppers and loads of variations. It includes an invaluable circle-skirt calculation chart for making a skirt with a perfectly fitted hipline. Pants for the Dance addresses the exciting design possibilities for one of the most ubiquitous yet unsung garments in the dancer’s wardrobe, pants! Go beyond the basic harem style and explore the variety of options for creating pants for male and female dancers alike. 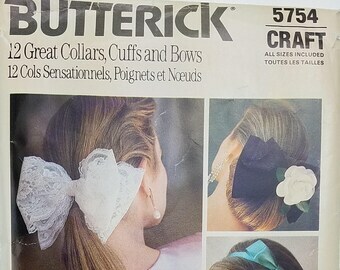 Includes directions for making harem pants, gusseted pants, draped pants, and dozens of details such as fitted yokes, cuffs and applied surface designs. From taking your measurements to drafting the patterns, from construction to final embellishment, Skirting the Issues & Pants for the Dance is an invaluable resource for belly dance costume designers. This book is jam-packed with design concepts, detailed directions and helpful hints for bringing your costuming ideas to life. Even if you are not a belly dancer, the basic designs featured throughout this book are great for adapting into casual, comfortable ethnic inspired street wear. 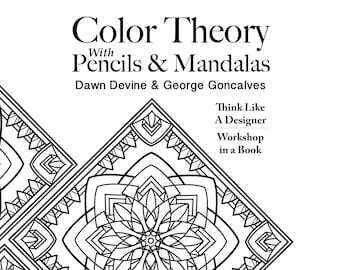 This book gives you the tools to be your own costume or fashion designer! Bags and Shawls Accessories Pattern. Uncut. One Size. 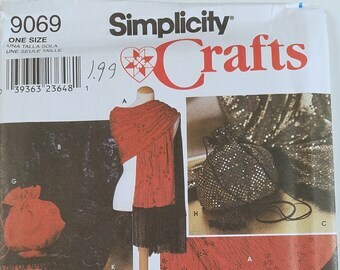 Simplicity Crafts 9069. Misses' Dresses Clothing Pattern. Uncut. Size EE 14, 16, 18, 20. 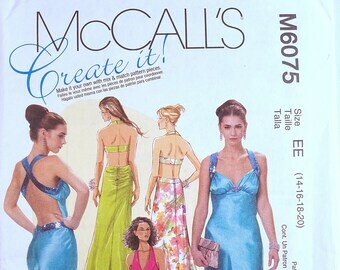 McCall's M6075.